January is Volcano Awareness Month. I haven’t had much opportunity to be aware of volcanoes, considering the raging garbage fire currently trashing the White House, but now seems like a good time to repost this article I originally published at Scientific American. Enjoy! United States volcanoes sure have been busy grabbing our attention this spring! Both Mount St. Helens and Mount Hood have experienced earthquake swarms (which, darn it, is completely normal activity and not a sign of imminent eruptions). Kilauea had some exciting new lava breakouts recently. And Mauna Loa just got bumped from normal to advisory status due to an increase in seismic activity (although it’s not quite signalling an eruption – yet). These volcanoes are quite different from each other, but they share two things in common: they’re pretty popular, and their eruptions can have some pretty serious effects on urban areas. You may have these or other volcanoes as neighbors. It pays to be aware of what they’re up to and what they’re capable of. You’ll definitely want a plan for coping with any of their shenanigans! So here are six easy steps all of us living near active or potentially-active volcanoes can follow to keep safe and happy. Look up your nearest volcanoes on your country’s geological survey website. Check out the hazards map. Don’t have a hazards map? Bug your politicians for one! No, wait, DON’T PANIC. Stop that panicking. You’re fine. Everything’s fine. Seriously, it is. Hazard maps look scary, yeah, but you can cope with this. ♥ volcano monitoring. Make sure your government knows it’s important. That’s how you’ll know to put your plan into effect in plenty of time to stay safe. See? Easy-peasy! Now you can sit back, relax, and enjoy the dangerous but beautiful and exciting fire mountains near you. 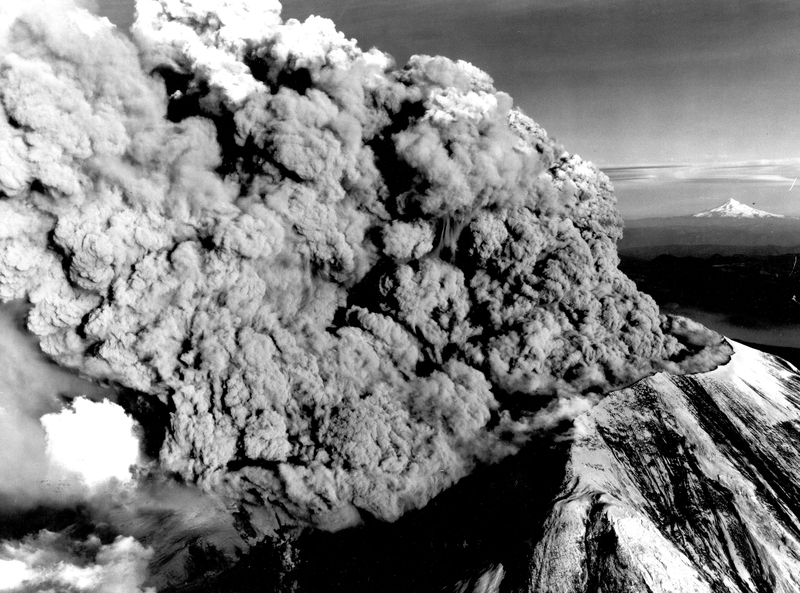 Mount St. Helens erupting on May 18th, 1980, with Mount Hood on the horizon. Public domain image courtesy USGS.